Disclosure: Today’s Pineapple Fried Rice is brought to you by Minute® Rice. Pineapple Fried Rice made with Minute® Whole Grain Brown Rice: pineapple, ham and veggies with a flavorful whole grain brown rice comes together so quickly, you can have dinner on the table in under 30 minutes. It’s a much healthier version of takeout and less expensive too! Use a non-stick skillet or Wok to make delicious Pineapple Fried Rice. Have all of your ingredients chopped and prepped for fast cooking. The flavors are so fresh and crunchy with all of the yummy veggies and pineapple. If you would like a vegetarian option, omit the ham and replace it with tofu, or just as is. 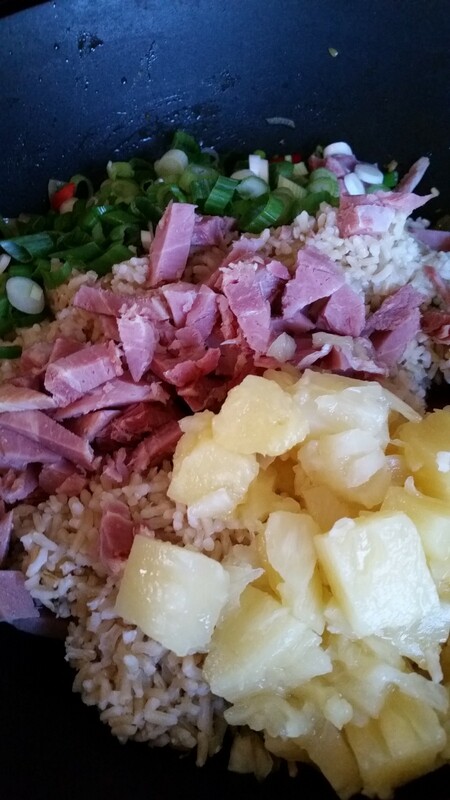 The Brown rice has a delicious texture along with the ham being salty and the pineapple being sweet. It’s a wonderful combination of salty and sweet. Minute® Rice is quick and easy to prepare and is a great pantry staple and a go-to ingredient your whole family will love. If you like the nutty, rich flavor of brown rice, Minute 100% Whole Grain Brown Rice is a delicious, nutritious option, and it has similar nutritional values as regular long cooking brown rice, but is ready in just 10 minutes, that is only 1/4 of the time! Minute® Rice is gluten free and non GMO too. Cook rice according to directions. I used the microwave directions on the box. In a heated Wok, add olive oil. Add garlic and onions, saute until translucent. 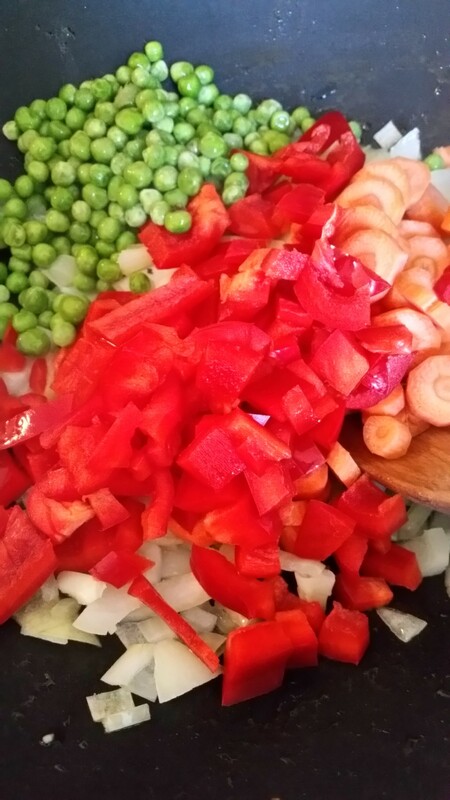 Add peppers, carrots and peas. Stir for 3 minutes. Add rice, pineapple, ham, ginger and sauce. Stir until combined, keep stirring for 3 minutes. Serve immediately. 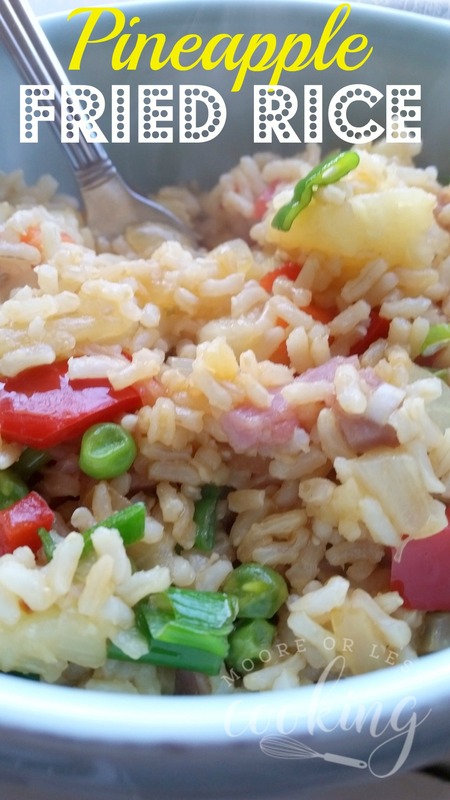 Pineapple Fried Rice made with Minute® Whole Grain Brown Rice: pineapple, ham and veggies with a flavorful whole grain brown rice comes together so quickly, you can have dinner on the table in under 30 minutes. It's a much healthier version of takeout and less expensive too! In a small bowl, combine soy sauce, walnut oil, and ginger powder with a whisk. Set aside. Heat olive oi in a wok over medium high heat. 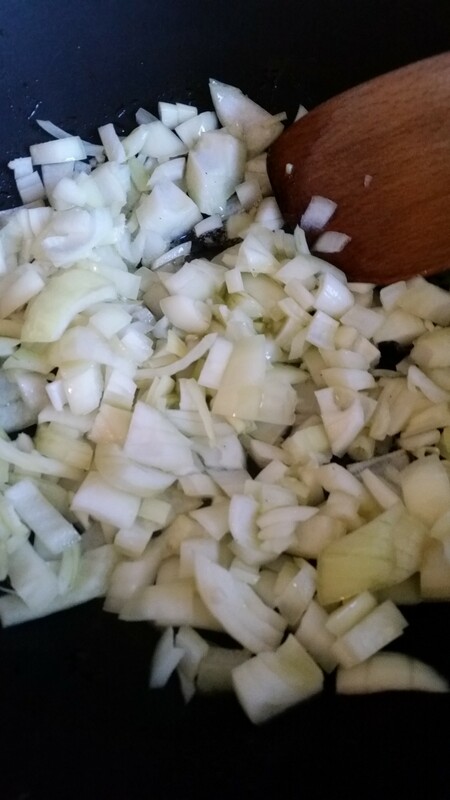 Add garlic and onion to wok, cook and stir for 4 minutes. Stir in carrots, red pepper, ginger, peas, cook and stir for another 4 minutes, until veggies are tender. 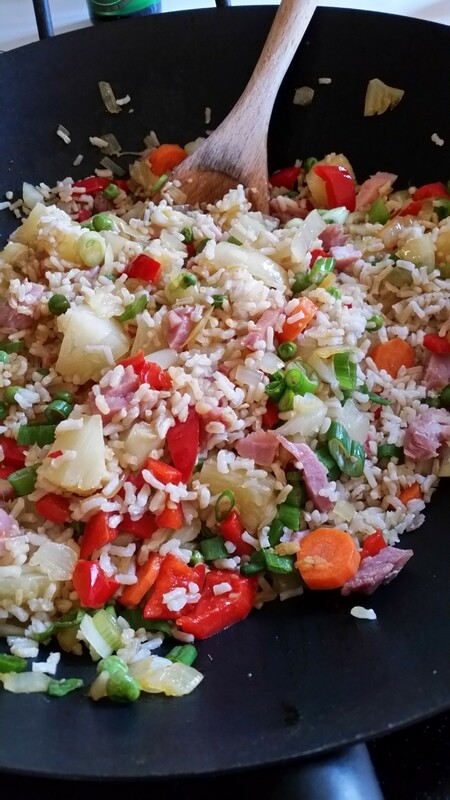 Stir in rice, ham, pineapple, green onions and soy sauce mixture. Keep cooking and stirring until all the Pineapple Fried rice is heated throughout, for about 2 minutes. Sprinkle green onions over each serving. 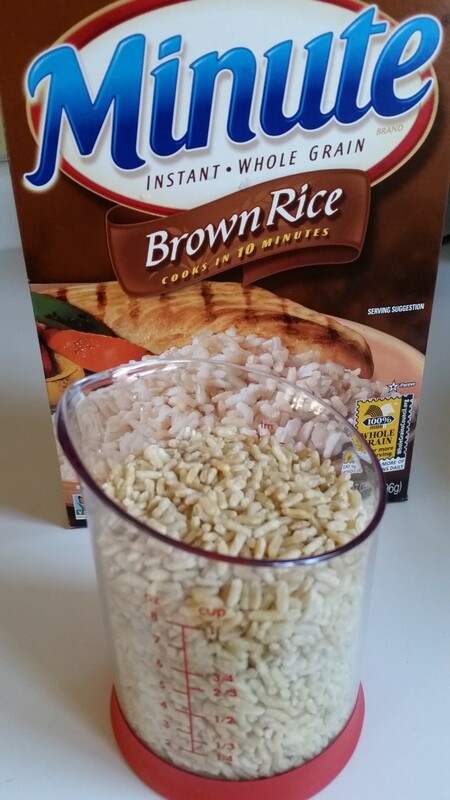 Disclosure: I am participating in the Minute® Rice campaign. I received compensation in exchange for my participation in this campaign. The opinions on this blog are my own. I love fried rice, and this tropical twist on a classic is perfect! I didn’t know that Minute Rice had a brown rice! I’ll have to keep an eye out for that! Thanks! I’d like a big bowl of THAT for dinner! I was unaware that MInute Rice had brown rice. Thanks for the info! I love fried rice! I love the flavors you added here and it looks so festive, too! Minute rice is a staple in our house! This looks great! This recipe looks amazing! I love the flavors you have added to this yummy rice. So glad to know it’s NON GMO! Great dinner idea! Pine apple fried rice looks so delicious! Love that you have used brown rice. So healthy! I love pineapple fried rice and can’t believe how easy it is to make at home. Yours looks so delicious, Nettie! What a perfect summer meal! All these veggies make it healthy too! What a fun and flavorful dish Nettie! I will definitely be adding your recipe to my spring dinner menus! This beautiful combo certainly speaks my language. Love the color and healthfulness. Good to know that the rice is Non-GMO. That can be a “deal breaker” for me nowadays. Mmm this sounds gorgeous – and how handy with the minute rice too! Lovely! What a great easy dish! I need to try it once!